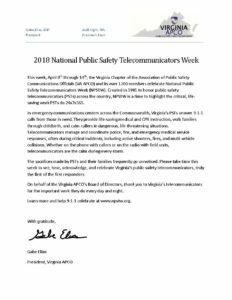 On this first day of National Public Safety Telecommunicators Week, I want you to know how grateful I am and the Board is for the work you do, the way you do it, and the support and energy you give each other and this Chapter. Tell your stories and listen to others’ this week. Share your passion for public safety with your peers and partners. Thank your families and support network, who endure your absence during emergencies and lift you up after the tough calls. And have some fun! Keep an eye on our Facebook and Twitter for NPSTW fun all week!